Founded in Sun Valley, California by Bodie Stroud, this shop designs and builds a vast array of hot rods and other customs. They design and create cars, custom chassis and various components. One notable offer from BS Industries is the 1956 Ford F-100 Program. Right on the web site, you can order a 1956 Ford F-100 customized for you through a simple “check the boxes”-system. 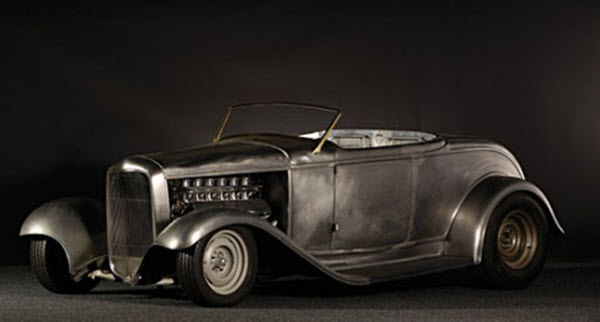 Throughout the years, BS Industries has created a lot of extraordinary custom cars, including the 1956 Ford pickup truck that received the 2007 Truck of the Year award at Truck Jamboree and the 1960 Ford Starliner (“The Scarliner”) that won the Ford Design Award – Best of Show at SEMA in 2009. Bodie Stroud also built a 1951 Mercury commissioned by Johnny Depp and a 1970 Cadillac Coupe de Ville for Johnny Knoxville. In addition to builds and custom jobs, Bodie Stroud and his crew are known for their skills when it comes to restoring cars. They have for instance restored a vintage Lamborghini for Adam Carolla. BS Industries also take on really odd projects, such as turning a 1950 Studebaker Commander into a bathroom sink or a Volkswagen van into a bar. In the early days of BS Industries, Bodie Stroud focused chiefly on cars made in no later than mid-1960s. Today, Stroud and his shop has developed a wider repertoire that includes cars made well into the 1970s. They make anything from classic hot rods to stock restos to full-on Pro Touring cars. Cars from the 1970s are still pretty affordable compared to older cars in good condition, which means that they are within reach for a larger number of customers and customers can also afford to put more money into getting the car restored and customized since the purchase price is lower. Bodie Stroud grew up in Tujunga, California and developed an interest in cars at a young age. His father always had old cars around, and one of them made an especially large impression on the young Bodie Stroud – a turquoise 1957 Chevy Bel-Air. When Stroud was 16 years old, he got a 1961 18-window Volkswagen Bus and became responsible for repairing it as needed. Stroud eventually tarted his automotive career by working as a heavy duty diesel mechanic. In 2007, Stroud opened his own hot rod shop in North Hollydoow and the rest is, as they say, history. Stroud was a student at Art Center College of Design in Pasadena for a year, taking classes in still life drawing and cartooning. He begun drawing cars in his late 20s. Stroud invented the EZ-Aline adjustable tubular control arm and holds the patent for this nifty tool. During his long career, Stroud has built over 100 diesel motors and over 75 flatbeds and trailers. He has worked on anything from custom hot rods to big rigs, tractor trailers and heavy duty trucks. For the wider audience, Bodie Stroud is arguably most famous for his work as lead fabricator and co-host on Travel Channel’s “Rock My RV”, his work together with Jesse James in “Monster Garage” and his appearances at Speed Channel’s “Hot Rod TV”. At Hot Rod TV, Stroud worked on a 1968 Copo Camaro commissioned by Tim Allen. (Allen also commissioned a 1950 Cadillac from Stroud. ) When History Channel decided to reboot their “American Restoration”, they turned to Strouds Los Angeles-based shop and tasked them with restoring rare and amazing vintage cars.